Local SEO is the most important online marketing factor for businesses that rely on local customers. Without a strong local SEO strategy, a business will have trouble appearing on SERPs (search engine result pages); and nowadays, that’s a death sentence for any business. While local SEO and national SEO rely on some similar elements and strategies, they differ in practice and implementation. Important SEO factors such as CTR (click-through rate), backlinks and keyword placement still matter when it comes to local SEO; but local reviews, citations and listings take on added importance. Marketing a business in the Charlotte area means specific attention must be paid to Charlotte SEO. It’s important to implement traditional SEO techniques, to help with overall SEO value, but it’s equally important to focus on the local area; because this is where the greatest source of potential customers resides. Google is still the king when it comes to search. The majority of all websites (and businesses) are found via Google. This means it’s important to control and brand a business’ SERP listing. The best way to do this is to claim your Google My Business page. By claiming your Google My Business page, you’re able to dictate some of the information that’s shown when your business is displayed. Instead of just showing your business’ website, and a brief description, Google will display all of your contact information, photos and even reviews. In this way, a business can brand its own Google search listing. Not only is claiming your business on Google helpful for Charlotte SEO (and is one of the top local SEO tips), it’s incredibly easy to do. Simply visit the Google My Business page, and get started! 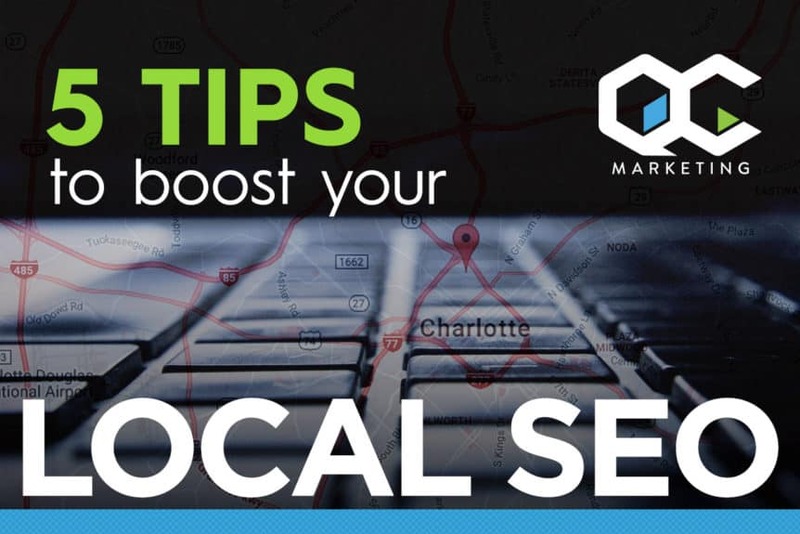 The reason claiming your Google My Business page is the top local SEO tip (and should be part of every Charlotte SEO strategy), is in part due to the 2nd local SEO tip: getting local reviews. Customers can provide reviews for your business on your Google My Business page, which can be shown on SERPs, and help add authority to your business. Other sites, such as Yelp, YP, Angie’s List, and plenty more, also give customers the ability to leave reviews for a business. Reviews are a business’ best friend (obviously good reviews are best, but even a few negative reviews can be helpful from time-to-time). Since local customers will almost always perform a quick search before deciding to shop, visit or purchase, reviews help persuade potential customers to do business with you. Review sites, in terms of local SEO, are great because they often include links to your website (and citations), and generally come from sites with authority. These review sites connect your business with the local area and make it easier to rank your business for Charlotte searches. It’s important to get reviews for your business, so don’t be afraid to ask your customers to leave one. You can even offer an incentive in return. Of all the local SEO tips we’re providing, this is the only one that will use bold text: every single page on your website should list your business’ name, address and phone number! Not only is it important to place your NAP on every page, but in the exact same way, every time. Whatever your name, address or phone number, make sure it’s written identical everywhere. All of your business’ social media pages, business listings, citations, review pages, etc., should use the same NAP. This will make it easier for search engines to connect the NAP with your business, and improve your rankings. Anytime your NAP is listed, anywhere on the internet, you’ll get credit and the authority of your website improves. Local SEO, like national SEO, is about links and citations. For Charlotte SEO, it’s important to acquire these citations and links from local websites, listings, forums, and more. Since these sites are often visited by local customers, being listed and cited here can help search engines connect you locally. The list of potential sites that can be used for links and citations is too big to put here, but do a quick search for Charlotte business directories, or sites related to your industry, and you’ll find plenty. Beyond these are Charlotte publications, media outlets, bloggers, meet up groups, events and more. Acquiring local citations and links is part searching and listing, and part PR. Reaching out to these local sites or resources can be the first step in getting a citation. While this local SEO tip is perhaps the most difficult and time-consuming, it’s also the one with the greatest potential benefit. When it comes to Charlotte SEO, this local SEO tip isn’t much different than traditional SEO. It’s important to add “Charlotte” throughout your website (or whichever area your business is physically located, such as Concord, Huntersville, Rock Hill, Gastonia or another Charlotte Metro area). Make sure to add your local city on all of your web pages (and your Nap! ), and within the page title, page descriptions and URLs, whenever possible. Don’t “stuff” the keyword into places where it seems unnatural, but adding Charlotte, or another local city, a few times on each page, will help. Need More Charlotte SEO and Local SEO Tips? Unfortunately everything written above only scratches the surface of Charlotte SEO, and an entire book could be written about all of the potential local SEO tips. But that’s what we’re here for! QC Marketing is the best Charlotte marketing firm when it comes to Charlotte SEO and improving a business’ SEO in Concord, Huntersville, Rock Hill, Gastonia and the other Charlotte Metros. Our team of local SEO experts knows exactly what to do after all of the local SEO tips above have been completed. Give us a call and we’ll help your business get better local SEO results. We’re offering a 100% free consultation to all Charlotte businesses that need help with local SEO. As the most trusted Charlotte marketing firm when it comes to SEO, QC Marketing is here to offer local SEO tips for businesses looking to improve their Charlotte SEO techniques. Our local SEO tips have helped businesses in Charlotte and the surrounding areas (like Concord, Huntersville, Rock Hill, Gastonia and other Charlotte Metros), improve SERP rankings. While other Charlotte marketing firms claim to be experts in national SEO, we’re the best Charlotte SEO marketing firm around. Don’t believe us? Just do a quick search for any of our local clients and let the SERPs speak for themselves.